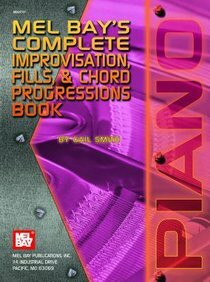 This book was written to provide a methodology for improvisation on the piano. Patterns are analyzed in and notated in all keys. Example are given to illustrate how and where a fill fits. Then, step by step you can learn how to add the left hand accompaniment based on a lead sheet, or improvise with the right hand. While improvising, patterns may be woven into a beautiful tapestry of sound. Just as a kaleidoscope creates beautiful colorful patterns before your eye, the patterns in this book will enable you to create a kaleidoscope of musical sounds for your ears. Most of the book consists of short examples using familiar tunes. About "Mel Bay's Complete Improvisation, Fills, & Chord Progrssions Book"